Human hibernation: Research in primate hibernation could hold the key to suspended animation in humans. Do Lemurs Hold the Secret to Suspended Animation? What we might be able to learn from our closest hibernating cousins. 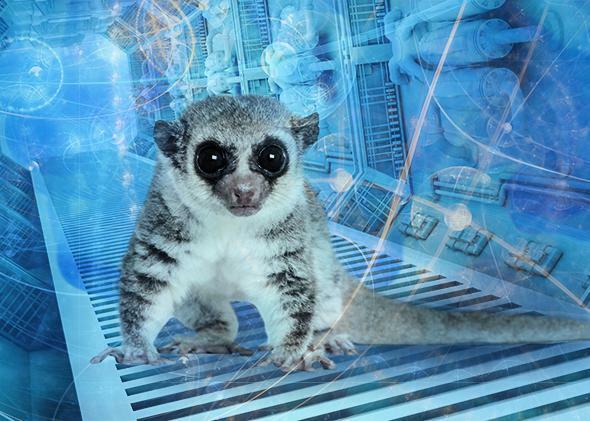 A fat-tailed dwarf lemur in an artist’s rendering of a suspended animation chamber. Excerpted from Shocked: Adventures in Bringing Back the Recently Dead by David Casarett. Out now from Current. You know all about suspended animation because it makes an appearance in virtually every science-fiction movie that’s ever been made. Usually it’s portrayed as a handy device for space travel. But what you probably don’t know is that suspended animation isn’t just science fiction. It’s real. And it could save lives. Suspended animation is really just slowed metabolism, like hibernation. Think of it as artificial hibernation. When animals hibernate (and when science-fiction characters venture off-world), they’re in a state in which their cells have downshifted to low gear and they need very little oxygen. That’s handy for intergalactic travel, of course. But what if we could use that trick in situations in which our cells—and particularly our brain cells—don’t have access to much oxygen? That might be the case for a patient who has suffered a cardiac arrest and who isn’t breathing. Or someone injured in a car accident, or someone with a serious gunshot wound. Or a soldier injured on the battlefield. But suspended animation could prevent those deaths simply by decreasing the amount of oxygen that those people need to survive. Decrease their metabolism by 50 percent and we double the time that they can survive without oxygen (more or less). Decrease it by 90 percent and we increase it tenfold. Normally, even 15-20 minutes without oxygen will typically cause serious brain damage, but in theory, suspended animation could open that window to an hour, or even a day. That’s why lots of researchers are very interested in understanding how hibernation works in animals, and that’s why I’m standing in a small, cool room that’s lit only by a weak red light. I’m here because this room holds the secret—maybe—to new treatments that will save lives and help us cheat death by putting people into suspended animation. Specifically, I’m here to meet lemurs. They’re the only primates that hibernate. So lemurs might be able to teach us humans how to do the same thing. Peter Klopfer, one of the founders of the Duke Lemur Center, is a fervent believer that lemurs are the best way to learn hibernation lessons that could help people. Soon my eyes adjust enough to see three little lemurs hopping around their cage. I’m surprised by how small they are. They have big eyes and fat tails. And they’re maybe 12 inches long. As we watch the lemurs frolic, Klopfer gives me a whispered summary of lemur hibernation research. He tells me that until very recently no one thought that any primate could hibernate. Bears, yes. Rodents, certainly. But everyone thought that when primates face a tough winter, we just bundle up and tough it out. In 2005, though, a German team of researchers collected the first evidence of prolonged hibernation in fat-tailed dwarf lemurs (Cheirogaleus medius). That discovery raised the very intriguing possibility that other primates—like humans—that don’t normally hibernate might be able to pull off the same trick. Lemurs are much closer to us, genetically, than other hibernating animals are. And that’s important, because if we want to understand how hibernation works in a way that might someday help people, it pays to study hibernation in an animal that’s as close to us as possible. This is the challenge of interspecies research. If we find the secret ingredient of hibernation in another species that happens to fit our physiology, then there may be enormous opportunities for saving lives. But if whatever provokes hibernation in another species isn’t in our physiologic repertoire, then we’re back where we started. So Klopfer and his colleagues are looking for something in the lemur’s repertoire that we also have in ours. So what’s the secret to lemur hibernation? Now we’ve left the lemurs to themselves, and Klopfer is taking me on a tour to see some of the obviously nonhibernating lemurs that are swinging merrily through the trees on the grounds of the sprawling sanctuary. “Hibernation,” Klopfer tells me as we walk, “isn’t a conserved trait.” He pauses. “It’s convergent.” Klopfer adds this last little clarification with a clipped precision that seems like it should make things crystal clear. Alas, it doesn’t. I suspect that my blank look reveals my ignorance. Conserved? Convergent? What he means, he explains, is that hibernation is something that species have evolved to do in very different ways. Hibernation in a squirrel might look like hibernation in a lemur or a groundhog, or a bear. In fact, the physiology—low temperature, slow metabolism, low blood pressure—look exactly the same. And indeed, there are plenty of researchers studying hibernation in all of those animals. However, the mechanisms that make it possible for each animal to hibernate are likely to be very different, because these animals have very different genes and physiology. That is, they’ve all figured out how to hibernate via different routes. That’s why Klopfer is a vocal cheerleader for what I’ve come to think of as Team Lemur. He thinks we have the best chance of learning how to hibernate if we study species that are close to humans on the evolutionary tree, like primates. So what’s the secret to primate hibernation? “We don’t really know,” he admits. “But, we have hypotheses … ” He pronounces this last word very, very carefully, enunciating every syllable, in a way that seems to convey just how difficult and laborious this process is. One of the most promising, he says, seems to be ghrelin, a 28-amino acid peptide (very small protein). The most important thing to know about ghrelin is that also it occurs in humans. OK, but how might ghrelin work? Its dominant effect—at least as far as we know, Klopfer is careful to clarify—seems to be that it induces hunger. (The name ghrelin is derived from the proto-Indo-European linguistic root ghre: “to grow.”) It has effects on the hypothalamus that induce hunger, for instance. It also reduces satiety, meaning that we eat more before we feel full. So maybe decreased levels of ghrelin induce hibernation. Low ghrelin levels would lead to decreased hunger, torpor, and a generally reduced metabolism. Think about it as the hormonal equivalent of the aftereffects of a big Thanksgiving dinner. In fact, ghrelin has been used in early clinical trials as an experimental treatment of anorexia nervosa, with encouraging results. And people with the congenital disorder Prader-Willi syndrome, which is characterized by increased appetite and obesity, have very high ghrelin levels. Still, that’s highly speculative. Even if ghrelin is associated with hibernation, that doesn’t mean it causes that state. Maybe it’s just a byproduct. And, to be fair, there are many other molecules that might cause suspended animation. For instance, there’s hydrogen sulfide, the gas that comes from sewage and rotten eggs. There’s also a molecule called adenosine monophosphate, or AMP, that some researchers think might induce hibernation in animals like mice and dogs, which don’t normally hibernate. In fact, there are some scientists who believe that AMP molecules hold the key to hibernation in humans. That’s based on some fascinating research by Cheng Chi Lee, a biologist at the University of Texas in Houston. Cheng has found that when AMP is injected into mice, and they’re placed in a cool cage, their metabolism drops by more than 90 percent. Their heartbeat and breathing slow to almost nothing, and they feel cold to the touch. But then the AMP wears off in a few minutes and the mouse warms up, wakes up, and walks away. I’ve seen this happen in Cheng’s lab, and it’s truly impressive. Who knows which of these will turn out to be the secret to suspended animation? This area of science is still very young. But everyone doing this research agrees that the ability to protect hearts and brains for hours or even days would be a game-changer in modern medicine. The question seems to surprise him. Klopfer strokes his beard, deep in thought. Under the hood of a rain parka that obscures his eyes, he looks a little like a wizard, if wizards dressed in Gore-Tex and track suits. I agree. So there’s hope for us all. Not only might it be possible to put humans in suspended animation, but that’s a lot of dreams to look forward to. Let’s hope they’re pleasant ones. Reprinted from Shocked: Adventures in Bringing Back the Recently Dead by David Casarett with permission of Current, a member of Penguin Group (USA) LLC, A Penguin Random House Company. Copyright (c) David Casarett, 2014.